The Vintage Wobble Afghan pattern debuted last fall, and it was a very special pattern to share – be sure to read the story behind this great stitch HERE! And one of the many awesome things about this pattern is that it’s a one row repeat! All the variation is in the colors, so it’s super easy to memorize, and it makes a fantastic stitch buster. 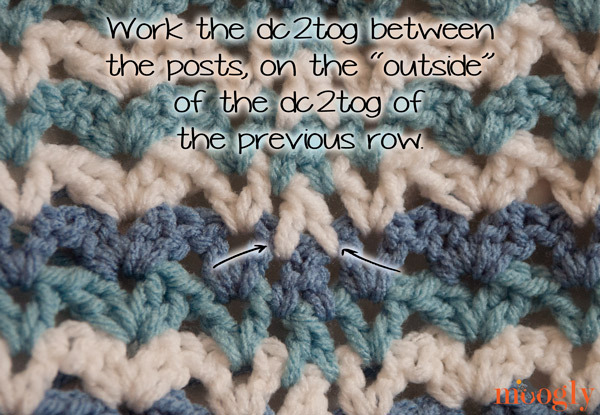 However, the stitch placement on that one row can be a little tricky… so at your request, here’s a tutorial for how to crochet the Vintage Wobble Afghan! In the video tutorial I’ve used Red Heart With Love and US-J, 6.0 mm hook made by Craftwich Creations. The pattern uses a multiple of 12 stitches, plus 7, plus 2 for the starting chain. 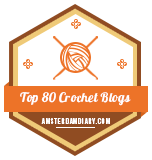 And yes, I did miss the second to last stitch in the very last row in the tutorial – but I think you get the idea! I can’t really do a photo tutorial for this stitch, since it’s just one row, but I’ve included the closeup picture from the pattern below, as well as the chart (hand-drawn by yours truly). If you remember that each row is a new color here, you can see where the stitches go within the pattern. There’s a full repeat represented in both the photo and the chart! And of course you’ll find the full written instructions on the original pattern page. Easy enough I hope! 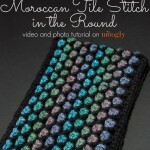 This is such a great stitch pattern – easily memorized and perfect for passing down to your own grandchildren – you’ll be able to tell them how you learned it on the internet back when people had to use computers and tablets and phones to connect! 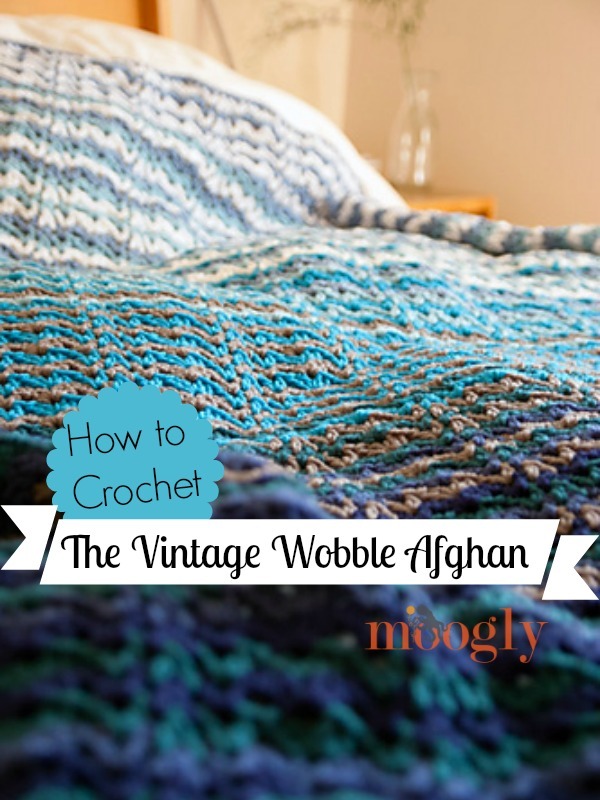 I hope you’ve enjoyed the Vintage Wobble Afghan tutorial – let me know what other stitch tutorials you’d like to see here on Moogly! Written pattern, photos and chart copyright Tamara Kelly 2013/2014. Please do not reprint or repost this pattern, but please do link to this page to share this pattern with others, including the first photo in the post if desired. If you wish to make items for sale from this pattern, please visit the About page for details. I’m wondering why you break the yarn. Is it easier then to crochet the edge? And you don’t have to tie off the ends? I’m used to ending the last stitch with the new color. This one is hand-drawn, but since then I have invested in a program! 🙂 Stitchworks Crochet Charts. 😀 Hey, I take it as a compliment! I won’t tell you how long it took me to learn to do it by hand… so much wasted paper!! Hi! I found your blog through allfreecrochet.com. 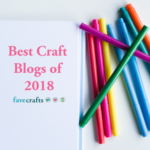 I’ve made several of your infinity scarves and I can’t tell you how many times I’ve hit up your tutorials and learned so much about the standing DC, the magic circle, the chainless beginning crochet. I don’t remember all the names, but let me just say I so appreciate all your work – patterns AND tutorials. 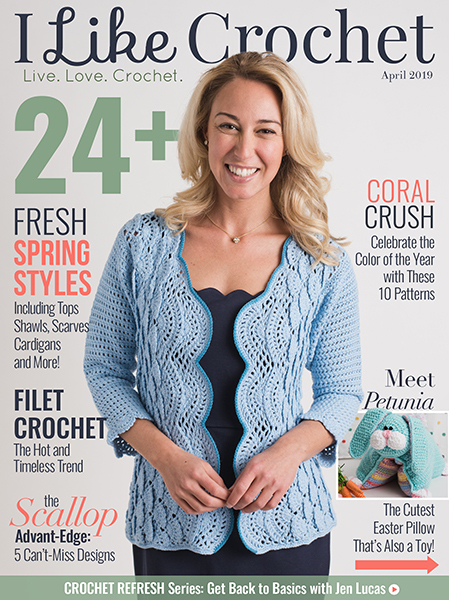 I learned how to crochet in 7th grade and have been doing so for the last 40 years. However! you have given me so much inspiration and challenged me to do different things. Again, thank you! 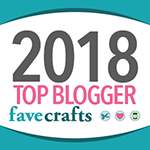 thank you once again for all your efforts and making crochet fun again! Hi Carolyn! Thank you so much! 😀 I really appreciate you saying so! Hello again! Thanks for replying. Actually I started plugging away last night and after five tries with different numbers I came back and finally saw someone else had asked a similar question and your reply to her gave me the impetus to try one more time. I then had to force myself to stop and go to bed last night. I am loving this. I love that it works up so quickly. I love the pattern. I confess I’m only using variegated yarn so it’s not as gorgeous as yours, but it still looks really nice. I bought the yarn THEN looked for a pattern to use…haha. I’m thinking this may not be the last one I make. 😀 I’m sure it’ll be lovely! I’m so glad you’re enjoying the pattern! I have only now discovered this beautiful pattern. Do you know the approximate year of it’s origin? Like Circa 1930 or 1917. It seems like it should be a very old pattern. I love the oldies!! Can’t wait to make one. I think I’ll use varigated yarn and give it a water color look? Maybe make it up as a Baby Blanket? 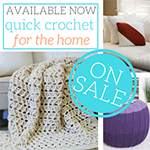 Need help where do I go for beginners how to crochet by step. 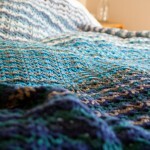 I LOVE this afghan, the colors and the stitch pattern. Thanks for doing the video tutorial. It made it possible for me to easily learn the pattern. Sometimes the written description is confusing-a picture is worth a thousand words! Would it be possible to have you show or describe how to neatly hide all those loose row ends when doing the border? 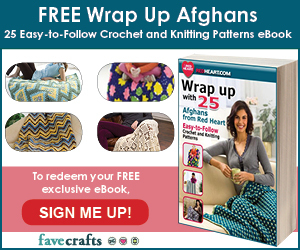 Thanks for a lovely afghan with a marvelous backstory! This is beautiful! 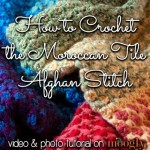 I was looking for a quick afghan to make for a gift and this one has such lovely colors. The ombre effect is cool. I would love to try your pattern. 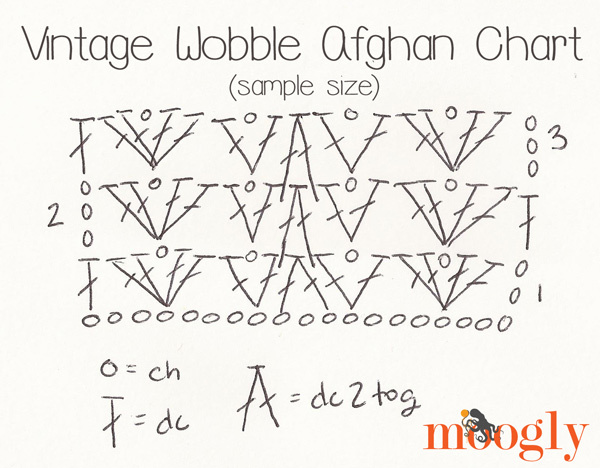 Do you know someone who could show your tutorial for the Vintage Wobble Afghan left handed? I find it challenging to follow videos for right handed crotcheters. Thank you. Really lovely, Tamara, I love shells, they yield such pretty fabric! 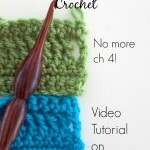 Hi I enjoyed the video and love the pattern, but have a question , I don’t want to change colors and just use the same yarn , would i just chain up three and continue working? I have been watching a lot on You Tube and enjoy learning different patterns. I cant read a pattern so watching some one do it is how i learn to do it. I have tried to flow a pattern with some one but just cant get it down. Thank you and hope to hear from you about this.